Heartbreak and grief touch every soul at least once in a lifetime, and Ranata Suzuki translates those raw emotions into words. 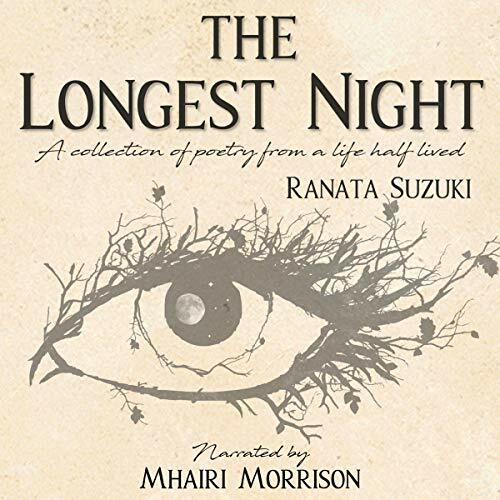 The Longest Night combines strikingly poignant quotations, powerfully emotive poetry, and captivating silhouette imagery to form a mournful lover's journal that explores a side of love that is deep, dark, and hauntingly beautiful. Each of the book's elements are skillfully woven together to reveal fragments of thoughts and feelings that seem almost to belong to the listener as years of painful longing are condensed into the context of a single night. The journal begins with "Sunset", in which poems convey the initial feelings of shock and loss first felt when a relationship with a loved one ends. As the poetry descends into an emotional downward spiral, the book progresses into its next chapter, "Darkness", in which emptiness, jealousy, sorrow, and despair are passionately portrayed. The concluding chapter, "First Light", sees the gradual dawning of a new outlook. The final poems express a gratitude for what once was, an acceptance of what now is, and come to the uplifting conclusion that even though a relationship can be fated to end tragically, the memories gained and lessons learned from it are, in their own way, treasured gifts that will last a lifetime. A book for anyone who has found themselves separated from someone they love no matter the circumstance, The Longest Night is a companion for the broken heart on the painful emotional journey that is losing someone you love from your life. Its words serve as a comforting reminder, whether you are travelling this road or have recently completed this journey yourself, that, despite the loneliness you may sometimes feel along the way, none of us walks this path alone. I don't even know where to begin.... just WOW!! This is the first ever audiobook I've ever bought so I wasn't sure what to expect tbh but WOW am I glad I chose this book! The actual book itself (the poems and quotes) are so emotional. There were points I had tears because I was so emotional (but in a good way). The start was soft and kind of dreamy, it got REALLY tragically sad in the middle but the end was really beautiful and more positive but in a believable way. Not in a cheesy fluffy clouds & rainbows way which I loved. I legitimately felt it had a healing vibe to it like closing a chapter and beginning a new one. The narrator was also really good! She does an amazing job of sounding sad or hurt at all the right points in the poems which helped me get into the feel of the book. Overall I loved this book and I absolutely recommend it!!!! Your work took me deep to the bottom of my heart, to that place that I forgot!